Rugged Circuits products are designed and manufactured in the USA with built-in protective circuits and performance enhancing features that put them a LEVEL ABOVE standard Arduino devices. We have invented a "RUGGEDIZED" market for those customers that need an Industrial Arduino solution. Our products are specifically designed to offer greater performance, last longer, and operate in environments where standard equipment fails. Our circuitry has been modified to protect against ESD, reverse voltage, over/under voltage, over/under current scenarios which occur within the product environment and/or by user mistake. Our customers demand hard working platforms that will endure and positively impact their project and bottom line. This is how we have forged our reputation over the last 11 years! If you are visiting our site you were either referred by an extremely satisfied customer, or are a returning customer. We don't advertise- everything is word of mouth. This alone is a testament to the quality of our products. Our products form the backbone to many integral systems across North America. Whether you are monitoring sensors in arctic conditions and need a -40C controller that will endure the elements, updating costly and clunky PLCs with an Arduino/Pi based system, or producing a product and want to reduce failure rates and uphold your important reputation, Rugged Circuits has a solution for you. We cater to military, industrial, corporate, and individuals alike. Our mission is to provide you with the tools to succeed. All of our products are built to a higher standard with carefully selected components and innovative protective features. We even offer a money back guarantee. Explore Rugged Circuits and you will be glad you did. The World Famous Ruggeduino. An UNO based derivative with Industrial Strength. IT IS HERE! NOW IN SE or ET Versions. Turn your Arduino into a PLC! Ruggeduino ET. An UNO based board with -40C operation and Industrial Strength! Industrial Mounting Solutions Arduino Systems. Integrated PCB Mounted Screw Terminals for Ultimate Grip. 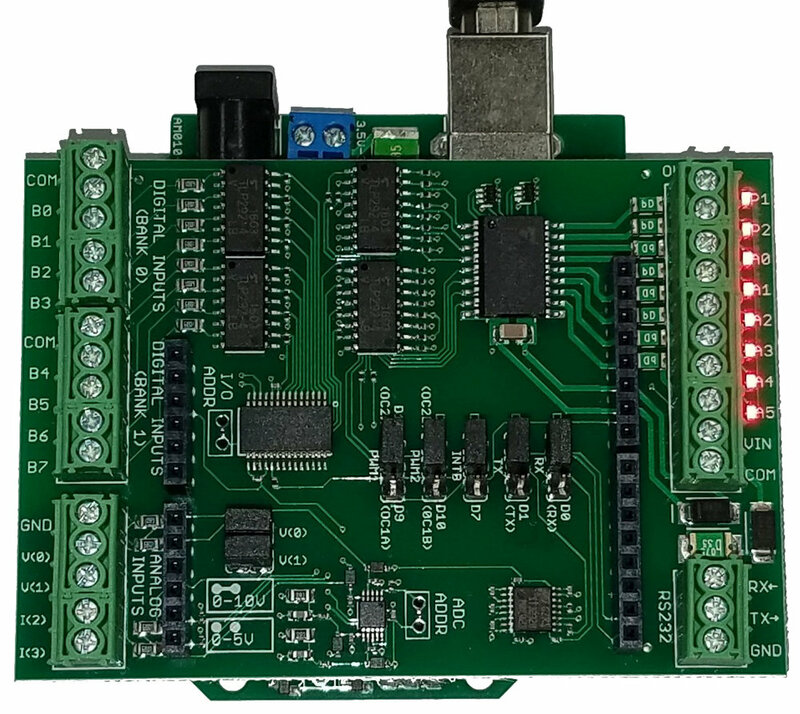 We have Breakout Boards for Uno and MEGA based Boards for a clean and efficient install. 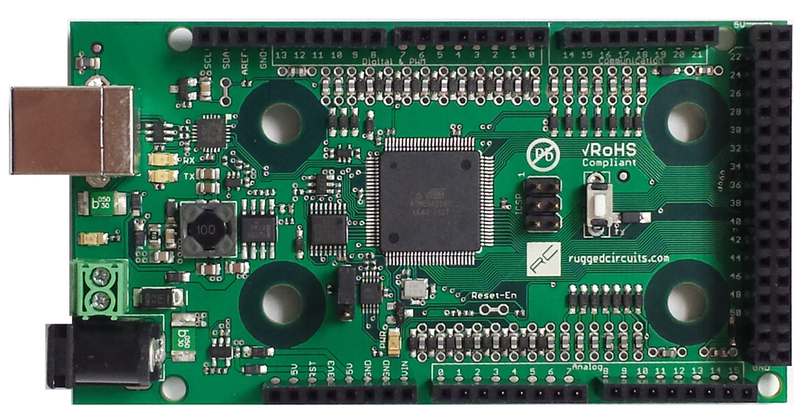 Rugged Circuits has hardware to take your Arduino based platform to the next level. Want more memory, increased connectivity, 24V signaling, or -40C Operation? Click Here. "I am in the heavy highway construction industry and began research for an improved method for remote communication and switching between various components of machinery. We needed high speed sensing and communication as well as ruggedness to be able to handle extreme temperatures, vibration, and fluctuating voltages as these are all very common issues in dealing with heavy construction equipment. We decided to integrate both CAN and rs485 communication protocols within the Rugged Circuits Arduino environment and once the basic circuitry and programming were complete, we then had to make sure the systems would be able to hold up to the elements in the field. In order to rule out any mechanical flaws within the systems, we proceeded to expose these Rugged Circuits boards to very long hours of high (and low) temperatures ranging from -10 to +180 deg Fahrenheit and excessive jarring and vibrations. We placed the running boards inside of flat black painted enclosures and ran them for 12+ hours a day in direct sunlight while and mounted the enclosures on the outer casing of 800 hp diesel engines where vibration and electromagnetic fields from large hydraulic actuators were at punishing levels for any electronic component. We even went as far as removing the flyback protection from various high current actuating solenoids and grounding these valves to drain directly through the MEGA's ground circuitry (actually attempting to cook one of the MEGA's to see where it would fail in the event of a serious grounding fault issue). Even with voltage and EMI spikes reaching triple digits, the MEGA's held their ground and didnt fail. Many of the components inside of these test enclosures simply couldn't withstand the torture and had to be redesigned or replaced with capable components, however we had a 100% success rate with your Rugged Circuits boards and have not had a single failed board both in the test enclosures or in the actual working systems out in the field. We now have 7 systems to date running over 30 Rugged Circuits MEGA boards. So, after a year + of evaluation adding your MEGA microcontroller into my design for equipment remote communication and controls, I have decided to permanently add these to the final design and look forward to many years of business with Rugged Circuits." We have THOUSANDS of satisfied customers since 2007 and rapidly gaining more! We are excited to help YOU! The testimonial above is just one of our many very happy customers. Imagine a 100% success rate against triple digit voltage spikes, vibrations from an 800hp engine, insane EMI exposure, and baking within an enclosure in direct sunlight. This is how Rugged Circuits can make your project BETTER! Take a deeper look into our website to learn more about our products including the famous Rugged MEGA.. The videos show the "little things" that go into the the thought process and design of our products to make "big differences" in performance and reliability. Inspired by our "10 Ways to Destroy an Arduino" these videos provide an in depth look at just how easy it is to damage a standard Arduino and how we have thoughtfully created a superior solution. The Ruggeduino SE/ET and Rugged MEGA PROTECT you from ALL 10 methods of destruction. 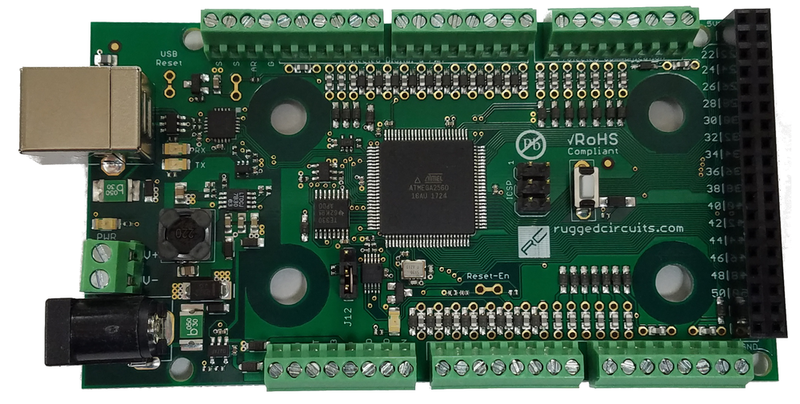 The protective features of Ruggeduino and Rugged MEGA make them the ideal Arduino UNO and MEGA derivative board. Rugged products will outlast and outperform regular Arduino boards and save you time and money. Our products are not just intended to safeguard against mistakes, they are designed to endure grueling environments.